Namco Bandai’s racing offering for the Nintendo 3DS has two things working for it. It is easily the best vehicle based offering on the launch day of the new system, and more importantly, it is just a fun game to play. The gameplay is a bit on the arcade side for those that prefer the ultra-realism of the Gran Turismo and Forza franchises, but the drift based mechanics make the game continually feel fresh and entertaining. Ridge Racer 3D doesn’t try to be anything other than what it is. You burn around tracks in a handful of cars through a use of speed, drifting, and race fundamentals. Many of the tracks will feel familiar to fans of the series, and they all are well designed. A handful of cars can also be augmented by three loadout options that you can purchase at the start of each race, including nitro and things like that. It won’t appease the racing simulator fans, but it makes the cars all entertaining to test out. The game types are straightforward enough, and besides the single races, you can enter a Grand Prix, compete in time trials and take on others that are nearby via a local connection. Ghost data can also be used to race against a CPU controlled version of your friends, but sadly, there is no online option which is an odd omission. The 3D is also well incorporated, and the tracks are interesting to race around thanks to the added depth. With the second screen offering a map, you can actually get a sense of the entire course, and not just whatever stretch you are currently on as is with the case with most racers. The graphics are also well handled, and while they won’t blow anyone away, they should keep people immersed in the races. The sound is also fairly solid, and the music is also well chosen. 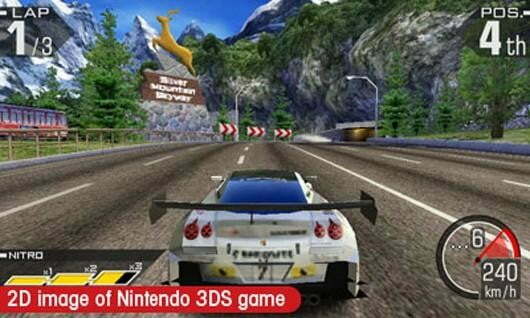 But beyond the 3D, beyond the car choices, and beyond the look and sound, Ridge Racer 3D is just fun to play on the 3DS. The slipstream mechanic pairs well with the drifting, and the controls are tight and responsive enough that you really feel like you can control the car exactly as you want. It may not be the most realistic thing in the world to go into a corner with another car and drift around them, but it is fun to do. The biggest problem with Ridge Racer 3D is that people will want more. That might sound like a good problem to have—and in some ways it is—but it won’t take long to complete every race, unlock every car, and generally grow so familiar with the tracks that you will memorize them. The game is fun, but more cars, maps and an online options would have helped significantly. Still, a racing game is only as strong as the driving mechanics, and this game is just fun to play which trumps most issues. If you are a fan of the series, then you will be pleased to see that Namco Bandai has handled the property well. Gamers that enjoy arcade style racing should make this one of their first Nintendo 3DS titles purchased. Days Gone stars a drifter named Deacon St. John in the post-apocalypse. Since he's somewhat of a lone wolf, the people he comes across are leery of him. That's where the Trust system comes into play. Here's what you need to know about it.